Well Angela Marsons has done it again! Well to be honest she has more than done it again, producing a book even more enthralling than her debut novel, Silent Scream, something I didn’t think was possible. How? Well we have the same intriguing protagonist; DI Kim Stone is a woman with a mission to ensure that those who do wrong are punished, a woman who is about as far away from victim as you can imagine, despite having being dealt a rough start in life. That’s not to say she’s without her flaws but that makes her even more believable although I wouldn’t want to be on the wrong side of that sharp intellect! In Evil Games our intrepid detective is trying to wrap up a horrifying case of child abuse, she doesn’t want there to be any loopholes so that the man responsible walks free but nor does she want anyone else involved to escape justice. She spurs her team onto action despite the frustrating lack of evidence or leads when a body is discovered. The culprit is soon located but Kim Stone can’t help thinking that there is more to the crime. This book really does delve into the workings of the mind, something that really interests me and hence why I’m drawn to psychological thrillers, so for this to occur in a more traditional crime novel makes this a truly special read. When Kim’s investigations lead her to Dr Alex Thorne’s consulting room the reader gets to read an intelligent and scary show-down as a battle of wits ensue as each woman is determined not to give ground. There are lots of reasons why a book is a ‘must-read’ and the key for me has to be the ability of the writer not only to come up with a good concept but to be able to tell a good story. This book absolutely meets that requirement. Second to that is that the solving of the crime has to be complex enough to hold my attention without being so fiendishly difficult that I am completely out of ideas, I don’t have to be able to guess as I’m notoriously bad at that, but I must be given the clues. To be honest, in this one I picked up on a clue early on and so was able to give myself a congratulatory pat on the back, but as there are multiple elements with plenty of red-herrings there was still plenty in the reveal to be satisfying. Lastly the characters have to feel realistic, again, I don’t know how Angela Marsons did it but there wasn’t one character that didn’t feel fully formed. That isn’t to be mistaken with I need to like every character, unlikely in a crime novel, but I do have to feel that they aren’t going to behave in an unbelievable way just to further the story. As a complete bonus point, I do like the setting of the Black Country, not an overpopulated region for crime fiction, and while it probably isn’t the most picturesque region of the UK, the parts that the author describes paint a picture of an area once dominated by the Industrial revolution with disused factories turned into apartments and canals aplenty. I can’t recommend this series enough, these are meaty books, with plenty to keep you thinking long after the final page has been turned. The only word of warning I give is don’t start it if you have an engagement you can’t get out of, you won’t want to put this one down. I’d like to say a huge thank you to Bookouture for allowing me to read a copy of this wonderful book for review purposes. 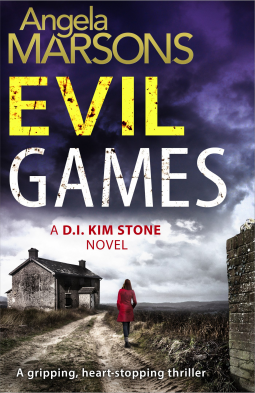 Evil Games is due to be published on 29 May 2015. DI Kim Stone first featured in Silent Scream and I’d recommend that you read that one first although it isn’t strictly necessary. Previous Post On My Bookshelf – What’s In a Name? Ah thank you Karen, Silent Scream is definitely worth a read! So glad you liked this one as well as you did, Cleo. It’s a really interesting concept: a psychological suspense sort of mystery in the context of a more traditional mystery. I can see where that could work really well. Thanks for sharing this. I do enjoy the mix that has begun to appear in some crime fiction. I love the psychological and with the right story it works well in conjunction with a police procedural mystery. So glad you enjoyed this second book. Sounds like a very promising series. And one I’ll be glad to read. This is a great series with both books covering some really serious issues but not in an overly depressing way. You do – these are exceptionally well-written and totally thrilling. It’s always good to read an enthusiastic review, and your enthusiasm is contagious. However, given the subject matter, I’ll pass on this but will try to remember the author’s name for future reference. Finally watching Broadchurch 2 btw. Thanks Guy – what a treat! I’m happy for you that you got to read a solid, good book. There is nothing better than a book that’s satisfying on so many levels! Oh my gosh! Yes! This is a read that I would enjoy. I had not seen it until now. Thank you for the great review and recommendation. I will let you know when I read the book. Oh I’m glad it sounds like something you’ll enjoy – I’ll look forward to hearing what you think!